Greetings to one and all. Hope you got some riding in amidst the rain over the past weekend. 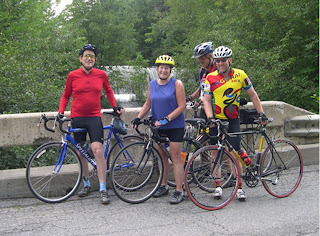 To start us off in June, Frank Rosen has another great ride in store for us, starting in Readfield. Look forward to seeing you all! "Three Lakes and a Bog" - a backroads tour through Readfield, Winthrop, Wayne, and Fayette. START: 9 AM, at the parking lot behind Readfield Insurance Co., near the junction of Rt. 17 and Church Road at the blinking light in Readfield Center. TERRAIN: Variable, from flat to rolling with a few hills thrown in. HIGHLIGHTS: scenic back roads and lakeside rambles, with a bakery stop near the end.